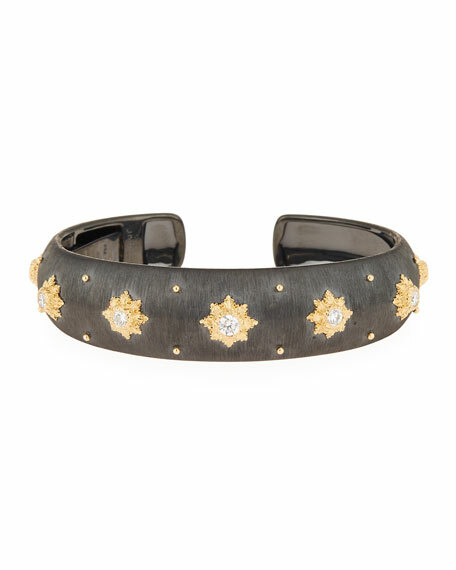 Macri cuff bracelet from Buccellati. Split black cuff with brushed finish. Round diamonds in gold settings. 0.75 total diamond carat weight. Launched by Mario Buccellati in 1919, Milan-based Buccellati is lauded for its exquisitely textured jewelry: gold and silver spun into sophisticated webs and often punctuated with precious stones. Each Buccellati piece is designed by Mario's son and grandsonGianmaria and Andreaand then handcrafted using traditional techniques. The meticulous metalwork of Buccellati's Italian artisans has become legendary; jewelry collectors all across the globe covet Buccellati necklaces, bracelets, cuffs, rings, and earrings.